Benadalid Malaga - Getting from Malaga airport to Benadalid. Benadalid is a small municipality that is one of the Andalusian small white villages, situated in the Ronda mountain range. Currently, it’s an important destination of rural tourism in Andalusia that offers the visitor the option of discovering part of the area’s cultural characteristics and tasting its rich culinary tradition. The roman origin of the small fortress is an unequivocal proof of its origin, although there may be unfound remains of previous inhabitants that have yet to be discovered. 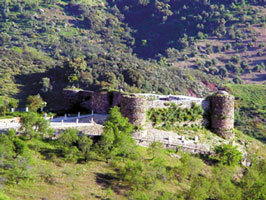 Benadalid was conquered by the Bereber Empire in the year 711, from when it obtained its name. In the 13th and 15th centuries it was alternately ruled by Granada and Africa. In 1492, the Christian army invaded and expelled the Moors fearing that their religion would fragment in the year 1570, also destroying the Arabic public buildings that were built. Benadalid was passed over from one to another and gradually repopulated until its castle finally ended up in the hands of the duke of Medinacelli, who ceded it to the town hall to be used as a cemetery in the 19th century. During the Spanish Civil War the entire village’s religious archives and pictures were destroyed. San Isidoro festivity: Celebrated on the 26th of April or on the weekend closest to that date. The Moors and Christians representation: With celebrations and activities for kids, gastronomy, religious cults and the famous representation of Moors and Christians. Asuncion day: During the whole day of the 15th of August, the locals from the village stop the cars by the side of the road to invite them to their August fair. Corpus Christi: A religious festivity with plenty of floral decorations all over the place. If you visit Benadalid you should visit the Humilladero Cross, built in 1776, where 2 brothers of Portuguese origin, that came to work on the enlargement of the churched, participated. These brothers got married and are the origin of the majority of the surnames “Fernandez” that exist in the village. A 70 Km. route through well looked after roads in good conditions, it shouldn’t take more than an hour to get to Benadalid from Malaga airport. If you need a vehicle when visiting the province, do not hesitate to compare car hire prices at Malaga airport with us. On the map below you can see our marked route which is the most recommendable, you can choose the toll road or the road that borders the whole coast. Town council: Plaza Beni Al Jali, 1 - 29493 Benadalid. Official website: Ayuntamiento de Benadalid.